Henry VII was the son of Edmund Tudor, Earl of Richmond, and his wife, Margaret Beaufort, a descendant of the eldest son of John of Gaunt and thus the first sovereign of the Tudor line. Henry was born most likely at Pembroke Castle, in the year 1456, the same year of his father’s death. Henry was placed ib the care of his uncle, Jasper Tudor. 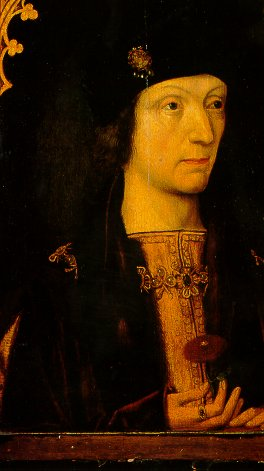 In 1461 upon the accession of Edward IV to the throne of England, Henry was placed under the care of Sir William Herbert. When Henry VI was restored to the throne, the young Henry was then taken to the king’s court. Following the victory of Edward IV at the Battle of Tewkesbury, Henry was taken by his uncle to Brittany. The Duke of Brittany refused to deliver Henry to Edward IV and later to Richard III. In 1483, and uprising was planned whereby Henry attempted to invade England in October. This invasion failed and several of the leaders of Henry’s revolt were captured and executed – the Duke of Buckingham oncluded. Finally, in August of 1485, Henry made a second attempt at invading England. He landed at Milford Haven, and confronted Richard III where he at last won a decisive victory at the battle of Bosworth, in which Richard was killed. Henry was at last crowned King of England in October 1485. The following year, 1486 , Henry married the Princess Elizabeth of York in perhaps an attempt to appear to desire an alliance between the rival houses of York and Lancaster. 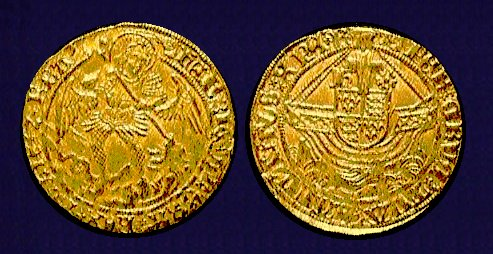 Nevertheless, Henry remained very much an enemy of the Yorkists. During his reign, there were numerous insurrections the first of which was led by Lord Lovel and the Staffords. The second was led by Lambert Simnel, who, under the instruction of Richard Simon, a priest of Oxford, crowned the Earl of Warwick in Ireland as Edward VI in May of 1487. Once again, Henry emerged victorious at the battle of Stoke. In 1492, Perkin Warbeck, claimed to be the Duke of York as son of Edward IV. His claim was acknowledged as by Margaret, Duchess of Burgundy and an attempt to invade England in 1495 met with disaster. Warbeck fled to Scotland, who gave him in marriage Lady Katherine Gordon. A second attempt to invaded England came in 1497. At the sight of Henry’s forces, Warbeck fled to Beaulieu Abbey where he was taken prisoner and sent to London and in 1499, he was finally executed. The last 10 years of Henry’s reign was largely peaceful. Henry seems to have been a shrewed business man. He managed to scheme some very clever money making propositions by declaring war on France, twice, to gain subsidies. He then secretly entered into treaties to make peace and was well paid for it. Meanwhile, no fighting ever took place. During later years, Henry employed the notorious Empson and Dudley, who extorted money on virtually any pretext. When his queen died in 1503, Henry looked for a new bride with the largest dowry. The reign of Henry VII was one of great significance. The social changes that unfolded would forever reshape western civilization. For it was during his reign that the destruction of the feudal system and the growth of a middle class began. Henry also introduced a more realistic profile design in his coinage marking the European influence in art and style. In 1507, Henry began to repent and illness brought his own mortality into view. Henry began to build monasteries throughout England and released prisoners for debt. Finally, at Richmond, on April 21st, 1509, Henry VII died. He was buried in a chapel he had erected for himself at Westminster. He was succeeded by his son – Henry VIII.